Let me just start this post by saying I’m typically not one to EVER stay in a hostel… and I mean no offensive to all the backpackers who love and live for it, but if I’m honest, it's never my first choice. (I think that might have to do with the fact that it became a horror film.) However, when the establishment starts to resemble the love child of a modern Scandinavian architect and the Ace Hotel.. I’m all ears. 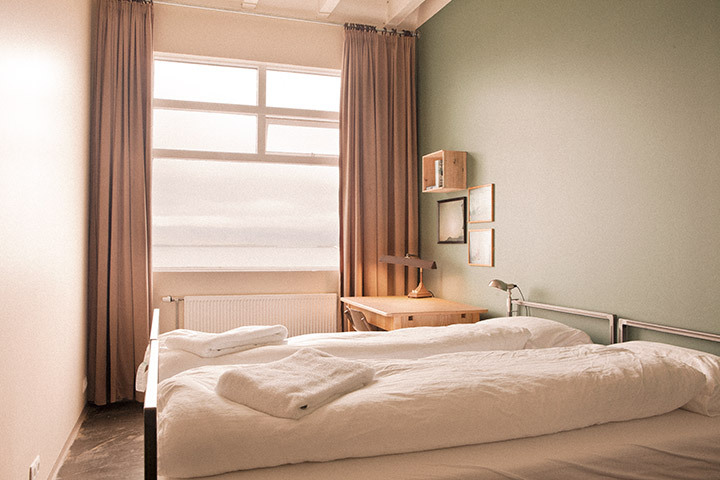 The Kex Hostel is the perfect place to call home during your stay in Reykjavik, whether for a long layover or a long weekend. If you are looking for a young, community-orientated place with incredible design and even better food this is really where it’s happening. The rooms are very well priced starting with typical dorm style rooms, with an option for a “family room”, great for either a small family or when traveling in a group of 4-6, and for those of you who are “hostel-shy” (like myself) they offer a double room plus which has the same amenities and privacy of a hotel room at a fraction of the cost. The sense of community stems from the consistent outturn of events and gatherings, from open mic and comedy nights, to group yoga classes and bar trivia. The guests are young and happy to be there and the staff are ready to answer any question you may have about their great home country. In the restaurant, funky Icelandic chefs complete with ginger beards and an incredible knack for mixing unexpected ingredients, really take it to the next level with wholesome local products paired with staples like fish and lamb. I personally took the Icelandic burger which was made from their grass-fed beef and my non-burger-eating mind was BLOWN. I guess this trip has been full of out-of-the-norm experiences for me, but this place is absolutely a must. If not for the night, then absolutely for the food and ambience.